I often hear prospects and clients say they will be more confident and ready to move forward in their business and get a better handle on their schedule once things are more certain. The problem with this Catch 22 is that there is no such thing as business as usual. Certainty doesn’t exist in the way we yearn for it to. So if you’re waiting for it to arrive, you will be waiting a very long time. It is human nature to want to feel in control holding a map laid out before us with guarantees. Mileposts that tell us exactly where we need to go next to achieve what we want. Warm blankets of security waiting for us at every turn so we know everything will be ok. Unfortunately it doesn’t work that way. 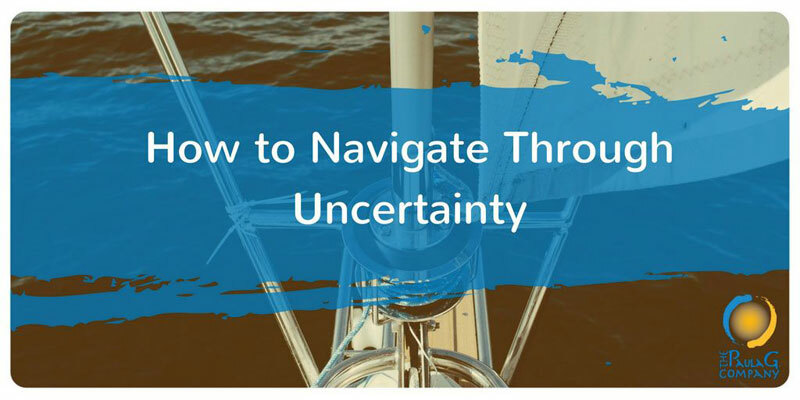 If there is one thing I’ve learned in my years of being a business owner is that uncertainty is the norm, not the exception. Learning how to navigate the waters is more important than having any map or heeding definitive advice of what you “should” do. When I work with my clients this is what I help them do. I always say my biggest hope and commitment is to help them learn how to think differently, relate more fully to the experience at hand, and to navigate the inherent uncertainty with confidence. Transition from corporate job to being my own boss full-time. Not knowing where to go or what to do to find clients while wondering how I was going to pay the mortgage each month. The illness and subsequent death of my Mom. Starting my business right at the turn of the recession of 2008. Several reinventions of my services, offerings, and desired ideal client. Illness and death of two beloved pets. Some minor health speed bumps of my own. Introduction of 3 crazy kittens to the household. and now upcoming heart surgery and recuperation for my Dad. Those are just the big ones… I have my fair share of the other, more everyday kind too, all while being the main breadwinner of the house. I am not unique. I am just like you. A life complete with challenges and celebrations big and small. I’ve learned a thing or two about how to navigate the uncertainty that I know can help you feel more certain in the midst of it all while not feeling so alone. I want to share those with you. Notice and honor what you are feeling: You cannot simply put on a happy face and keep marching forward when things get particularly challenging. Notice it, be honest with yourself, and give yourself the gift of feeling it fully. This will create an honest space and awareness from which to continue to move ahead. Get perspective: We need different perspectives at different times. Get guidance from mentors, coaches, or good friends that can be truly objective. Take time to move your mind and body. Have interests outside of your business. All these can help you “see” differently which is crucial. YOU are your most crucial asset. Take care of her in whatever way you need at any given time. This is not selfish, this is strategic and nurturing. Shift your relationship to time: “Time management” is not a static thing. In fact I’d contest we never really manage time, we simply manage our relationship to time and our priorities. How productive you are is not only a function of systems but also your emotional, mental, physical state. Honor the rhythms and flows that are happening at any given time. Keep walking the path: Sometimes you will be zipping along forward toward your goals. Other times you may be crawling. You will experience backward progress. It is all OK and part of the journey. Keep walking. Open to Options: What happens in our own minds is limited. Things are not “either…or”. Be willing and open to entertain possibilities you can’t even fathom from what you might see at any given moment. Don’t put things off: Life is precious and short. Don’t put off what matters most because your to-do list is beckoning. This includes taking time just for yourself and personal care. You can and must take time for these things. Need help navigating your business journey? That tricky place where life and business intersect? Like a trusted guide I can help. The best place to start is with a checkup of your business health. Learn more and grab your business health checkup here.